To foster a positive business environment in the Kelowna region by providing members with leadership, advocacy and services of value. 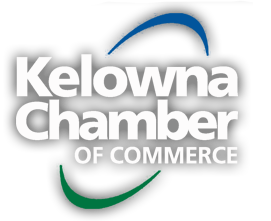 The Kelowna Chamber of Commerce is a welcoming not-for-profit, member-driven organization that improves the effectiveness of doing business. Whether to emerging entrepreneurs, or to small and mid-sized businesses, or to the largest corporations, the Chamber provides its members with the support they need to set up, maintain and continue to grow their business success. Through innovative programs, cost-saving business services and education, we act as a catalyst for business growth, partnerships, and for a diverse business community. The Kelowna Chamber of Commerce has credibility in the Business Community. We have celebrated our 110th year of service, having been established in our city since 1906. We are an Accredited Chamber of Commerce with Distinction. This verifies that the Chamber is run in a strategic and professional manner and that our operations reflect national standards of business excellence. The Chamber engages with businesses and their employees, educational institutions, government entities and elected officials. We serve as the voice of business, advocating with government contacts at all three levels, on behalf of business, addressing community concerns, and keeping members informed of proposed regulations that could impact business locally. There are a number of advantages to becoming a Kelowna Chamber of Commerce member. From connecting with your local business community to exclusive offers, we have tools to help you take your business to the next level. We're always seeking ways to connect with our target markets: business owners and decision makers. Becoming a member of the Kelowna Chamber of Commerce was part of our strategic plan - and the connections we made through their wide range of programs are far-reaching.